For blocking micron-sized particles, debris, powder, and paint overspray, there is no other disposable head covering that comes close in comparison to VitaFlex's Soft-stretch Hoods for effective protection, comfort, and low cost. Whenever a mask or respirator is required, a hood is needed as well. VitaFlex's Soft-stretch Hood securely covers the entire head, face and neck with a comfortable form-fit which provides an effective isolation layer next to the skin. The ultrafine intertexture openings allow body heat and perspiration moisture to escape which keeps heads cool for extended wear. 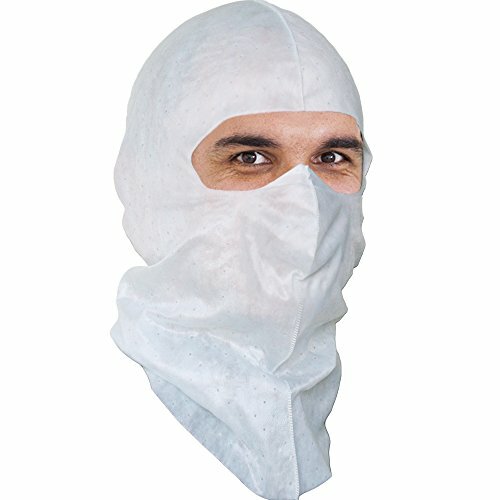 Nonwoven fabrics are the material for making surgical masks. Our patented technology is to make regular nonwoven fabrics soft and stretchy without adding latex or elastomers. Since 2018, the newly developed elastic nonwovens have enhanced elasticity and softness with a silky touch. The Hooded Coverall Suits made of impermeable material are stiff and unbearably hot, so the wearer usually takes the hood off while working. It is more practical and economical to wear our hood with an un-hooded coverall suit. This Full-cover version provides maximum coverage, forms air-pocket around nose and mouth and a tight fit around wearer's eyes. It can be worn independently, under or over a mask, in conjunction with a respirator, or as a liner under a hardhat, helmet, or face shield. Caution: VitaFlex's hoods are not for replacing mask or respirator required by OSHA. Keep heads cool and protected. New GSP version with increased effectiveness in blocking overspray. If you have any questions about this product by VitaFlex Soft-stretch Hood, contact us by completing and submitting the form below. If you are looking for a specif part number, please include it with your message.